Garfield offers a variety of one semester classes covering all aspects of Theatre from set design and construction through acting to stage managing. Never acted before? Take the Theatre 1 class for a great overview of theatre. Interested in building sets? The Technical Theatre class is the right one for you. Not quite ready for the main stage? The Theatre 2, Theatre 3, and Theatre 4 classes will prepare you for the next leap. Interested in Directing? Take Theatre 7. Theatre 8 – Playwriting is the class for budding writers. 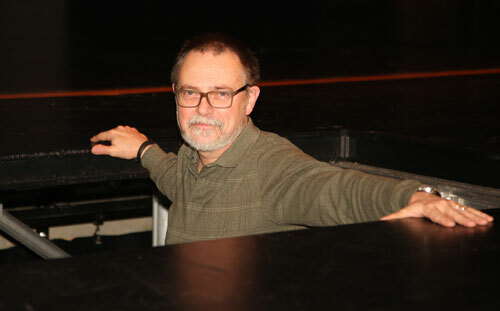 One class each semester is specifically geared to producing a show directed by theatre teacher Stewart Hawk. The Children’s Production class (Theatre 9) is offered fall semester and culminates in a series of performances for elementary school audiences in January. In spring semester, the Spring Musical class (Theatre 10) culminates in a full-scale production in May and June. Classes may count toward fine arts, elective, or occupational education credits. Children’s Show and Musical require afterschool rehearsals near production date. Parents are asked to assist in supporting the Musical through volunteer work and helping to provide after school snacks and concessions. Not all courses are offered all semesters. This continuation of Theatre I emphasizes student recognition, interpretation and dramatization of character objectives, relationships, emotional and physical traits within scenes. Students will identify and analyze character, relationships, plot, setting, conflict, and theme in the context of choosing and performing monologues. Following on the fundamentals learned in Theatre I and Theatre II, students will apply previous understanding and through reflection, demonstrating increased expertise in physical expression, vocal skills, theatre vocabulary, improvisation, character study, and production elements through performance. This theatre class for upper grades will introduce students to theatre styles/genres from different parts of the world through selected study of performance and dramatic literature ranging from early times to the present. Students will study a variety of performance techniques and written material unique to specific cultures and their time in history. This may be accomplished by viewing live performances, pre-recorded performances, reading about performers/performances, and reading selected texts. Students will analyze and evaluate how the performance, performer, or play reflects a particular culture, place or history. Students will further examine how the presentation or play helped to shape or reflect the social, economic or political climate of its time and how it might relate to our present lives. Students will explore not only the differences in performances and plays, but also the similarities and universal themes in performances/plays through history. Students will be expected to research selected periods of history to make these connections. Students will justify character choices in a performance based on their learning of a specific theatre/performance genre and how it relates to its culture and history. Students in this intermediate level course will apply understanding from previous theatre courses and/or experiences to analyze and create characters with multiple intentions and layered emotions based on the given circumstances. Students will gain a deeper understanding of subtext, or the underlying meaning of the spoken word. Students will analyze texts to identify theme, setting, plot, character, conflict, and objectives. Students will identify character development arcs including relationships, obstacles and tactics. Students will explore the playwright’s intention and the text’s cultural/historical context. Students will develop personal aesthetic criteria to communicate and apply artistic choices in directing pieces of dramatic literature. Student directors will read and learn how to analyze texts as a sequence of events that is dynamic and in-motion. Students will select a text(s) for the purpose of production. Students will develop a plan for implementing their conceptual understanding of their text and its dramatic structure. Students will collaboratively communicate characterization, relationships between characters, movement, pacing, as well as technical elements of set, sound, light, props and costumes. Methods of communicating ideas and vision with actors and designers will be discussed. This course provides students with an education and practice in the art of playwriting. Dramatic writing techniques specific to the stage, along with the aesthetics and sensibilities of performance will be emphasized. Students will learn how playwriting differs from other types of creative writing. Students will examine and analyze a variety of works, discussing themes and techniques, from different genres for understanding and inspiration. This examination of theatre literature will provide the student playwright with knowledge needed to develop a text for performance in a three-dimensional space. The focus for this course is the production of a children’s play for the SSD elementary schools. Students will learn the process of producing a professional play. Study of the rudiments of presentation includes but is not limited to, auditioning, acting, designing and constructing costumes, publicity and educational outreach. This course will mirror professional theater as closely as possible, culminating with a full-scale production of the children’s play. Students interested in stage management and costume design should speak with the teacher about joining this class. The focus of this advanced class is the production of a musical to be performed for an audience. Musical theatre combines songs, spoken dialogue, and dance. Students will learn the combination of skills which this theatre genre requires – singing, acting and dancing. The emotional content and story of the performance is communicated through dialogue, music, movement and technical aspects as an integrated whole. Students will be required to independently study scripts and music, work collaboratively as an ensemble with their peers, and be available for after school rehearsals and performances. Students may also assume other roles relating to the production such as stage management, dance captains, and rehearsal pianist. This course will mirror professional musical theatre as closely as possible, culminating with a full-scale production. Pre-requisite: Audition and with teacher approval; auditions held in the fall, extra after school rehearsals and performances for the general public. If cast, student will be enrolled in this second semester class. This production oriented course provides a foundation to stagecraft skills and safety procedures preparing students for industry and college study of technical theatre. Students will receive an introduction to the following: theatre terminology, scenic design and construction, lighting, sound, properties, costumes, make-up, special effects, theatre management and stage management. Students will actively participate on a crew to mount a production. The course will require a high level of problem solving and collaboration. Students will research costuming, properties and set pieces to support historical accuracy or vision of the production. The technical director will guide the use of power and hand tools in constructing set pieces, applying special effects, and using a variety of sound and lighting equipment. Costume construction and basic makeup application will be explored. Students will shadow the advanced production crews for stage management and/or theatre management including but not limited to: box office, concession, publicity, ushering, and backstage coordination. Behind-the-scenes show experience will be acquired through the school’s production schedule. Students will participate in a post production critique, analyzing production effectiveness and providing recommendations for improvement. By the end of the recommended two years of study, beginning technical theatre students will select an area of specialty to further explore in advanced courses. This course may be repeated for credit. In the Technical Theatre Advanced course students will choose a focus in one or more of the following disciplines: lighting, sound, properties, set construction, special effects, costumes, make-up, theatre management and stage management. This course builds on students’ successful completion of the Technical Theatre Foundations course series or related experience. Students will apprentice to the primary production designer in the construction, design, and performance process of their chosen discipline. Upon completion of the first two semesters of the course, students are prepared to assume a technical theatre leadership role in a production and begin to explore the portfolio process. In the final year of Technical Theatre Advanced students will assume a leadership role in a production as a designer in their chosen technical field. These students make up the lead design team to mount a cohesive main stage production. Students will participate in the post production critique for continued improvement of their design skills. They will create a portfolio demonstrating their knowledge and abilities as a tool for further education and/or employment. Students will formally present their portfolio and plans for further study or work in their chosen technical field. Through this process they will become aware of the many jobs and careers in the technical theatre industry and the requirements and skills needed to get those jobs. They will apply knowledge and skills by interviewing, shadowing and/or working in theatre internships and/or paid positions. This course may be repeated for credit.